WIP Wednesday – How embarrassing is this? I will admit that this is one embarrassing WIP Wednesday post. I say it’s embarrassing because, really, how many UFOs and WIPs can one person have? 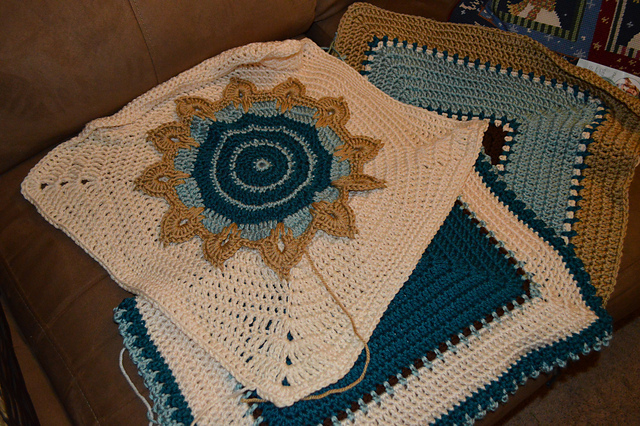 I just started yet another baby blanket the other night which is needed in about a week and a half or so. 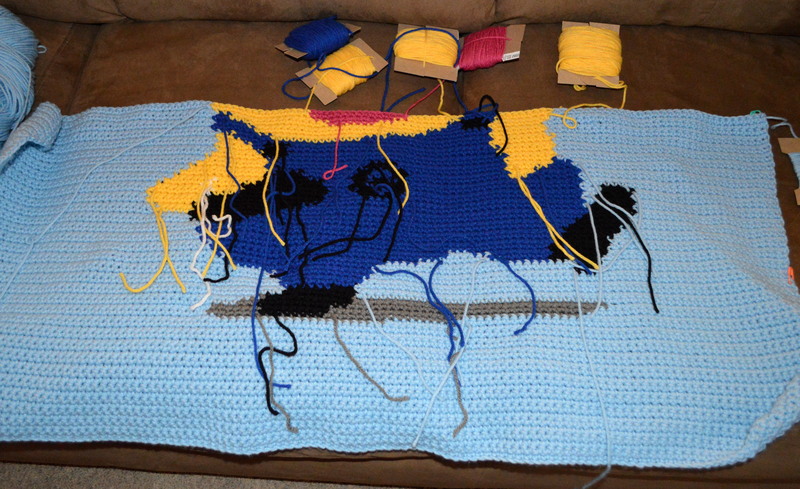 As I started it I was thinking of all the other projects that I have lying about just waiting for me to either finish hooking them or even worse, weaving in ends. Is there anything more sad than seeing a project that is done except for loose ends hanging all around? I have a couple of those. 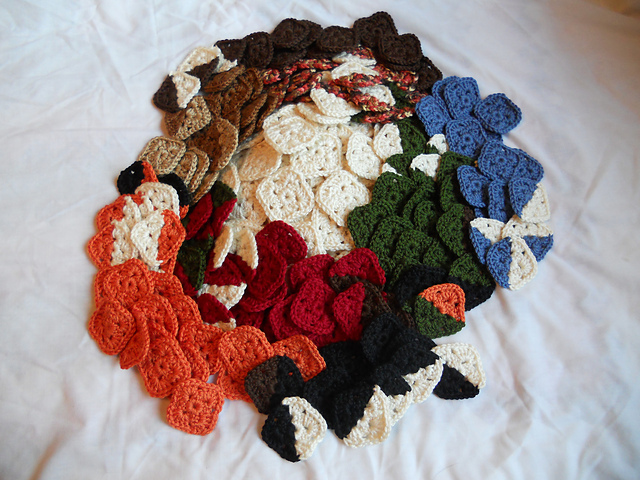 I have a few that have a ton of motifs or squares that I’ve worked up, I just need to stitch them all together. I get so much enjoyment from starting a new project and watching it grow row by row, but after a while I lose interest. Usually because I find a new pattern that I just absolutely had to start right now! So I thought I would air my embarrassing pile of WIPs this week. I originally wanted to vow that I would finish one of these projects a week, but come on, really? I know me and I know that won’t ever happen. But maybe I can finish one a month, that seems more realistic. I’m not even going to say the standard “I won’t start a new project until all of these are done”. Pfft, that is so unrealistic, my sides hurt from laughing at that one. So here is a portion of my embarrassing pile. These are the ones that I have pictures of, I think there are a few more tucked away in hiding that I’ve forgotten about or don’t have pictures of yet. In the spirit of full disclosure, some of these projects have been in the works for 20 or more years. Hey, don’t judge, I’ve already admitted that I have a problem. Isn’t that the first step in recovery? 20+ years in the making, Baby boy bunting. Do people even use buntings any more? Another 20+ years in the making. 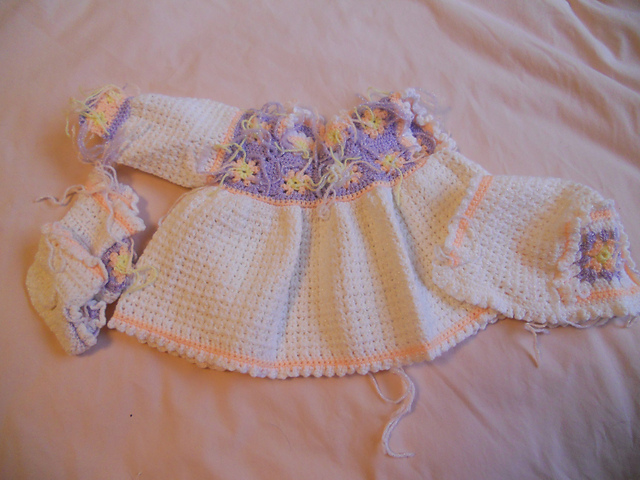 A granny square baby dress. Still have one sleeve to do and weaving in ends. 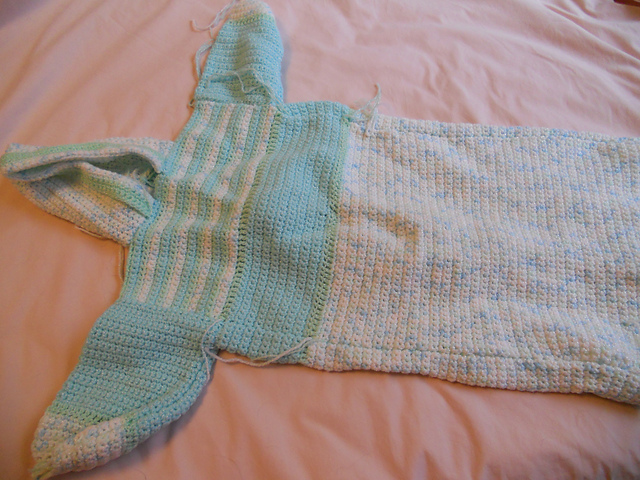 The matching baby blanket with only the weaving in ends left. 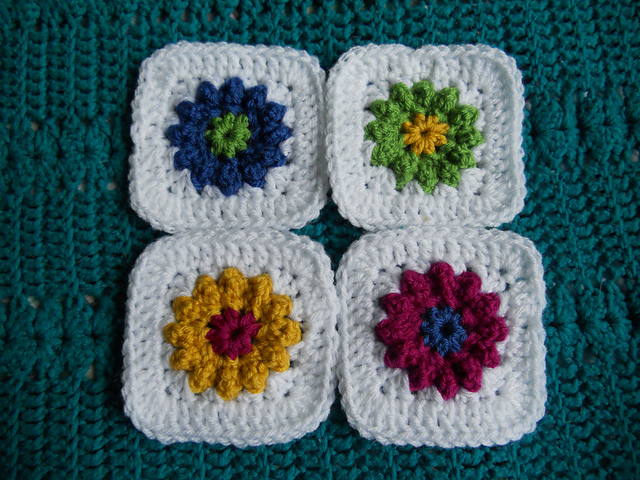 This was one of my first granny square blankets and I didn’t know enough at the time to sew in as I go as much as possible. This was supposed to be a Green Bay Packer afghan for my brother, another 20+ years old. I started it, had no idea where I was and wasn’t liking it so frogged it. I’ll start over eventually. It was actually a kit I had ordered from Herrschners. I call this Little Boy Blue. I think I started this because I was bored and just wanted to start something new. It’s about halfway done. 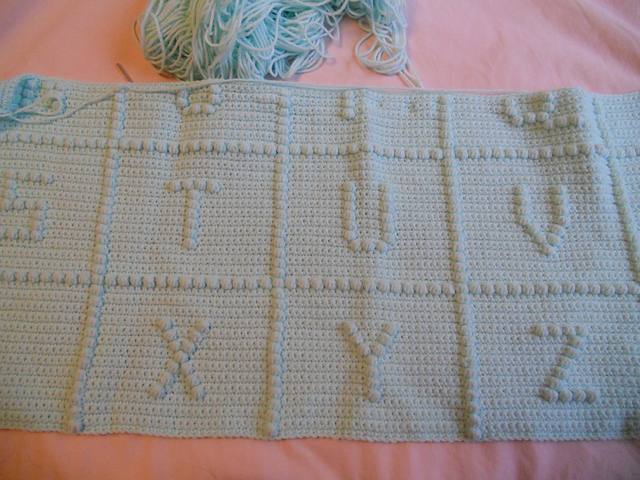 Baby Alphabet Blanket. I started this about 5 years ago when I first found out I was going to be a grandma. I ended up working on something different. I’m probably going to frog this and start over anyway, the stitches are too tight for my liking. Sage and Cream afghan originally started for my sister. It was supposed to match her newly decorated bedroom. Well that was at least 15 years ago, I think she’s changed the paint since then. 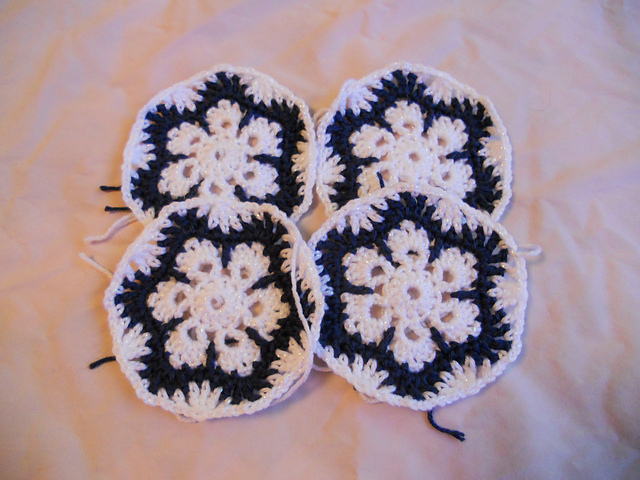 Snowflake Afghan for my daughter. Scarecrow quilt look afghan. Those are hundreds of 1 inch squares. I’m not looking forward to putting this together. 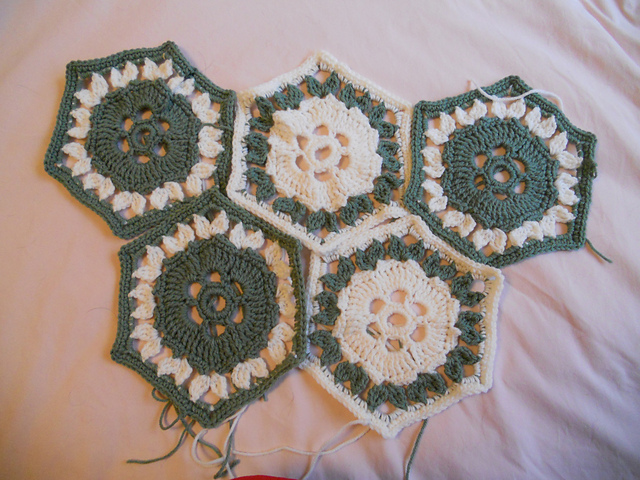 I don’t even have all the squares done yet. But at least the ends are sewn in. This is a mysteryghan I started about 3 years ago or so. I’ve worked on it here and there since then at least. 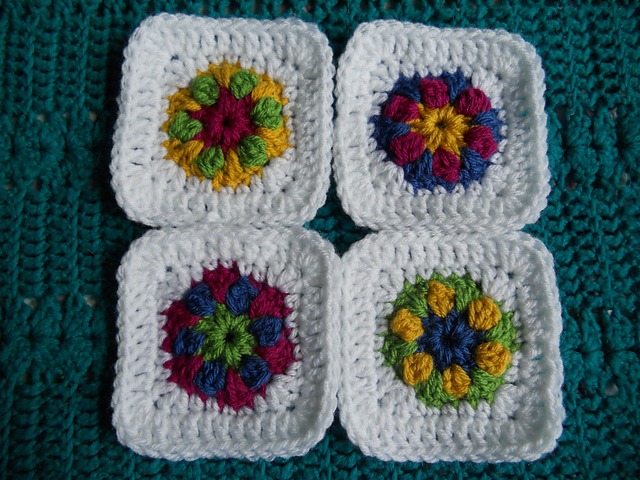 Here it is after doing some frogging and reworking of squares. Still have a few more to do. Another mysteryghan. This hasn’t gone much further than a few motifs. I’m not the flowery sort so kind of lost interest. I’ll be finding a worthy recipient once it’s finished. The first Picture Perfect afghan. I only had to do a portion of it for a test. I used what yarn I had immediately on hand and wasn’t really too pleased with the color combination. 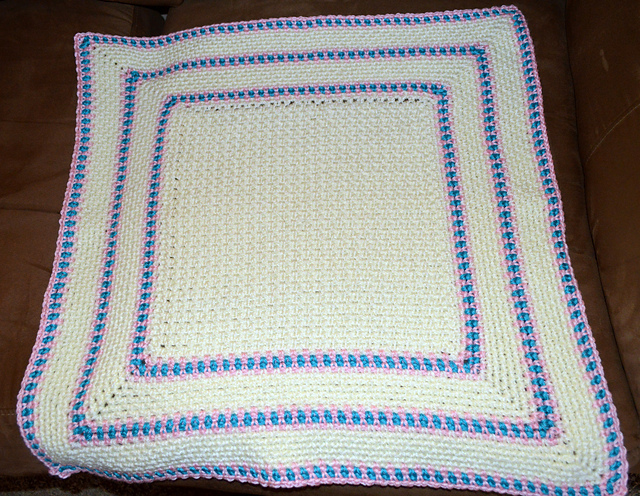 I will finish it up and hang on to it until someone else needs a baby blanket. The Minion blanket. This was supposed to be done for my daughter’s birthday in May. It’s a little bit further than this now, but not much. I’ve had a few other things to work on and it’s gotten entirely too hot to have this heavy thing on my lap. So that is my embarrassing pile of works in progress and unfinished objects. I know there are more, this doesn’t seem like nearly enough. Maybe next week I’ll post the rest….if I can find them. 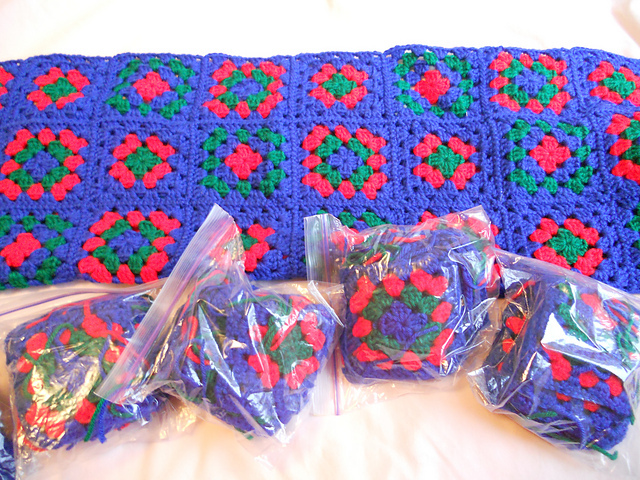 Hi, I love the Snowflake Afghan and I’d love to try one. Do you have a pattern your willing to share? Or can you tell me where I can find it? Thank you for your compliment on my afghan. I really need to finish it, maybe I can get it done before Christmas so my daughter can enjoy it. I found the pattern in Vanna’s Afghans A to Z. It’s called Winter Wonderland by Anne Halliday. Unfortunately the book was discontinued long ago but you might be able to find a cheap copy on Ebay or Amazon used? They have so many beautiful patterns. 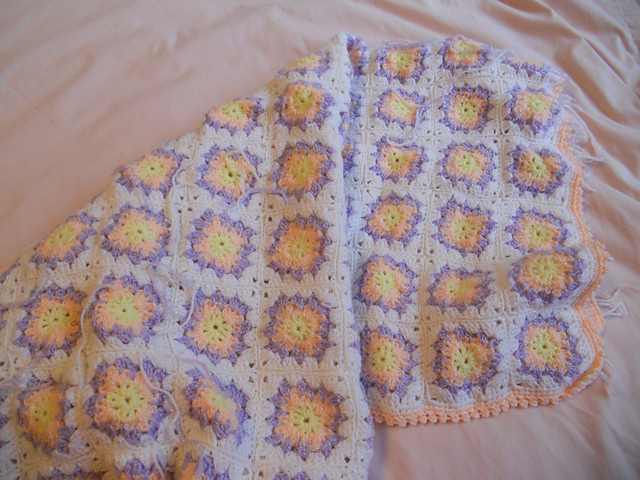 I think I’ve made at least three other afghans from it but I never took pictures. If you belong to Ravelry here’s a link to the book so you can see what it looks like. I’ve seen a few of the minion blankets made like that and really like them. I’d love to try one. Do you have a pattern your willing to share or is it made up as you go? I have just been winging it. I will share with you a few of the things I do for these. I don’t know if it is right it is just the way I do it. First I found a picture I liked and saved it. Then I found a free graghing website and downloaded the picture. I can’t remember which one but look for a cross-stitching one. You may need to outline the picture and fill in some colors on the gragh. Then figure out how much space you need on either side, in this case I wanted the picture centered. Use single crochet and just go for it. 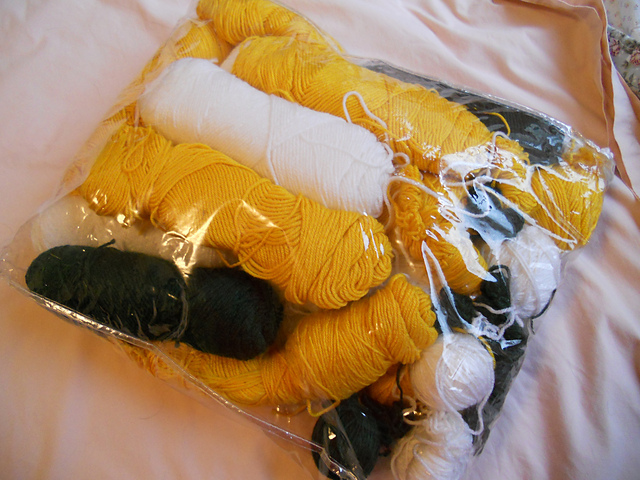 I carry the yarn for only three or four stitches max. I have several bobbins wound with yarn hanging all over the blanket. Hope this helps you a bit. We must be of the same breed because I have just as many if not more unfinished projects! Your work is beautiful! More alike than you know! I’m a major procrastinator too and thank you!